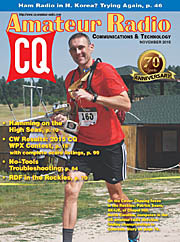 Includes columns published in 73 Amateur Radio Today magazine (November 1988 through September 2003), CQ-VHF Magazine (Winter 2004 through Fall 2003) and CQ-Plus digital magazine (May 2014 through December 2014). Web and e-mail links are provided where appropriate. Cover photos on right side are all by Joe Moell KØOV except November 1988, which is by Tom Curlee WB6UZZ. Plans for a super-simple two-meter TDOA add-on RDF set with no front/back ambiguity! Personal Emergency Locator Transmitters, are they a good idea? Time vs. mileage scoring, which is best? Complete plans for a versatile microprocessor-based foxbox by N6MBR. Click here to FTP download TBOX07.ZIP, containing the assembly, object and binary files for the microcontroller program (10K total). More on TBOX plus "receiver hunting"
11/92 -- What's That Whirligig? Southern California All-Day hunts are tough, this one included 4 states! 8/93 -- For T-Hunters Only ... Not! 9/95 -- The T Is On! Let's Find It! Part 2 of the series, covers staffing, running the hunt, scoring, etc. Introduction to simple and effective RDF equipment for VHF and UHF; this part covers beams, quads, dopplers and "sniffers"
Hams are amazingly clever when they hide transmitters for mobile T-hunts and on-foot foxhunts; here are some "tricks of the trade"
How to build inexpensive foxboxes for international-style hunts using surplus VHF-FM transmitter boards and ammunition boxes. A call for volunteers to help track wildlife and a review of the Hamtronics T301-2Y synthesized transmitter board with emphasis on its use in foxboxes. Marconi was just one of many radio pioneers from Italy who made possible today's hidden transmitter hunts. Also T-hunting in present-day Italy. John Oppen KJ6HZ finds a squawking ELT with just his handi-talkie. Also a formal practice session prepares Team USA and introduces ARDF to new hams. 1998 was a year of firsts for T-hunters and radio-orienteers, including Team USA's premier appearance at the ARDF World Championships in Hungary. The Halloween Hunt by KQ6XA was more than just spooky, it introduced Bay area T-hunters to international-style foxhunting. This report covers both the hider's and hunters' perspectives. Rechargeable alkaline batteries have advantages over other battery types for some hidden transmitters. Also, spurious signal tracking in New Jersey. Announcements of the 1999 Dayton Hamvention® Foxhunt Forum and 1999 IARU Region 2 ARDF Championships, plus an update on the Burrowing Owl Project. Tracking down unintentional interference to ham and non-ham frequencies, with southern California examples. More on the history of RDF and hidden transmitter hunting, from 18th Century London to the present. 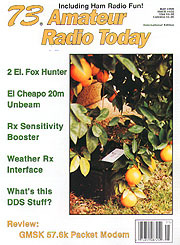 Tales of a great forum and foxhunt at the 1999 Dayton Hamvention®. A complete wrapup of the first IARU Region 2 ARDF Championships, and a look to the future. Find out what happened when a score of eager hamfesters tried to find 18 hidden transmitters in a historic 130-acre park. Participants in the Portland Championships are building ARDF programs in their hometowns. Also an update on the Burrowing Owl Project. Stories from Massachusetts, Oklahoma and southern California about T-hunters who are prepared to save lives by locating downed aircraft. How hunters of real foxes and other animals use RDF equipment to keep track of their hounds, plus a review of NCG/Comet's "RF Bug" detector. Whether it comes from a distant source or is generated right at your site, you can use radio direction finding to track and solve intermodulation problems in your repeater system. 10/00 -- USA Foxhunting Championships 2001 -- Start Planning! A site and sponsors for a multi-nation ARDF event are needed. Here's how to put on such an event. Stories of hidden transmitter hunts in San Francisco and surrounding counties. USA participates in the Tenth World Championships of ARDF in Nanjing, China and foxhunters of Orange County, California bring the fun to Scouts at Jamboree-on-the-Air. First announcement of the USA ARDF Championships to be held in summer 2001, plus news of the Friendship Radiosport Games in Victoria BC to be held a week later. The most frequently asked RDF-related questions, with answers of course. For sheer enthusiasm, it's hard to beat the mobile hidden transmitter hunters of Australia and England. Update on upcoming USA Championships, plus RFI tracking on 75 meters in southern California. G6UWO of Nottingham, England tells how he wins mobile foxhunting trophies with a motorized beam and polar bearing display. More details of G6UWO's motorized beam and display system, including a VCR headwheel rotary joint. Students in Pasadena, California learn about careers in science while building antennas and attenuators for RDF fun, sponsored by NASA. More student RDF fun and learning, this time in McKinney, Texas, with free radios and corporate funding. Update on hams tracking birds and cougars, plus news from readers and advice on foxbox labeling. Meet the stateside competitors, follow their training, and find out how they performed. Ride along as hams track a stolen UHF bus radio on the Florida coast and solve two sources of data QRM to GMRS repeaters in central California. Beams, quads and doppler sets are all popular among T-hunters in and around Daytona Beach. Read all about the fun they have. Update on plans for the Second USA ARDF Championships near Atlanta and the 2002 ARDF World Championships in Slovakia. Whether on foot or in cars, hams should have a chance to go transmitter hunting at every hamfest and convention. Here are some examples. Civic-minded hams track down illegal cordless phones, spurious emissions, and intruding differential GPS transmitters. First of a two-part series on the Second USA ARDF Championships near Atlanta. Conclusion of a two-part series on the Second USA ARDF Championships. Latest news from the world of RDF, including new polar plot software by Brian DeYoung, K4BRI and a sythnesized tuner for ARDF receivers by WB6WFK and K5ATM. A new novel for adults combines ham radio foxhunting and murder, plus ham radio fiction for youth. First of a two-part series on the Eleventh World ARDF Championships and Team USA's participation in it. More stories from Slovakia, including the pre-championships training camp in Hungary and "Cultural Day" adventures. Find out what a squegging oscillator is, why it's in widespread use today, and learn about some signal identification tricks for your computer. First of a series of articles on doppler RDF, with the basics and little-known facts about the man who started it all. We call them "Doppler" sets, but do they really follow the Doppler Principle? Also, the T-hunters of Albuquerque appear on Comedy Central. Reviews of an inexpensive wide-range loop RDF antenna from Wyoming and a feature-filled receiver/sniffer from Australia. The hunt for an illegal cordless phone in New Jersey, a promo for the Dayton Hamvention Foxhunt Forum, and more on Dopplers -- calibration this time. In the news: Two new wildlife tracking projects and the authorization of individual Personal Locator Beacons in the USA. Tracking gunshots with multilateration and the importance of having your Doppler antenna set as non-directional as possible, strange as that may seem. How to minimize directivity in your Doppler antenna array to give better performance when signals are bouncing. 9/03 -- Hide a Transmitter, Pay a Fine? Should hams have to get permits from the government to put on a transmitter hunt in a park? Also the first full-scale ARDF hunt in Florida. A full report on the 2003 USA and IARU Region 2 ARDF Championships in Ohio. Optimize the counterpoise of your mobile Doppler array for more accurate and stable bearings. A potpourri of ARDF topics including foxbox building, electronic scoring, medical preparations, and training camps. Interference-tracking stories from California, Tennessee and Kentucky, plus balloon and rocket recovery by RDF. Stories of the 2004 World Championships in Slovakia and transmitter hunts at hamfests in Florida and California. On-foot hunts bring fun to Palos Verdes students, Scout-O-Rama visitors and disabled Radio Campers. Hams help biologists in New York state find out what happens to Indiana Bats when they emerge from winter cave hibernation. Hams in Utah and southern Californa have fun on transmitter hunts while preparing for more serious RDF efforts. Tracking unintentional interference in southern California and attenuating signals when on foot. Hams and non-hams are keeping track of their dogs, cats, and elderly relatives with RDF. Coverage of RDF transmitters, receivers, and antennas for this part of the spectrum. Complete wrap-up of the 2006 World ARDF Championships and USA ARDF Championships, plus a new video on ARDF. How the new E911 cellular location systems work and their potential to save lives, plus other media coverage of ham radio RDF topics. These folks give new meaning to the word "foxhunting." Also news of the new TracMe rescue beacons on FRS. Display and map real-time mobile bearings automatically on your laptop with APRS or GPSS. What RDF equipment worked best in the high Sierra forests? When is a PLB not a PLB? RDF rescues a biker in California, plus lessons on ARDF training from Ukraine. Miniature "ditter" transmitters and matching receivers from Communications Specialists, plus an update on the Indiana Bat tracking project. Amateur Radio enthusiasts in Oregon help the Sheriff by finding ELTs in unusual places. Santa Barbara hams have an effective automatic ELT notification system. From the first foray to the World Championships in Hungary, the growth of stateside radio-orienteering has been rapid. One who helped was George Neal KF6YKN, who finally held the Stars and Stripes on the medal podium in 2008. Also, news of USA's 2008 championships and training camps. Tiny UHF transmitters make recovery of model rockets easy, even when they go over a mile high. Also, plans for the Ninth USA ARDF Championships. Help for getting transmitter hunting started in your locality, both mobile and all-on-foot. Includes unattended transmitters and antenna/attenuator building clinics. Story of the 2009 USA and IARU ARDF Championships near Boston, plus the Case of the Concrete Communicators. Should expensive permits and insurance be required when a few hams get together to practice radio-orienteering? Also, improvements to tape-measure yagis for ARDF. News of a USA ham who participated in the 2009 IARU Region 1 ARDF Championships, the upcoming 2010 USA and World ARDF Championships, and a rigorous simulated comparison of three mobile RDF methods. 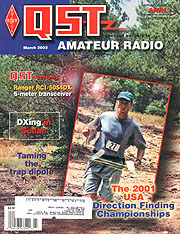 Photo feature on the 2010 USA ARDF Championships and a lesson learned about how passers-by can think transmitter hiders are up to no good. Photo feature on the 2010 ARDF World Championships and the First ARDF World Championships for the Blind. A new consumer device that claims to help drivers find their cars in crowded parking lots with 2.4 GHz RDF. Transmitter hunters help find a lost hiker in Arizona plus a new 222 MHz ARDF set from Communications Specialists. Review of the Byonics Micro-Fox 15 transmitter and KI6DYX's handles for measuring-tape yagis, plus the Australian foxhunting championships. 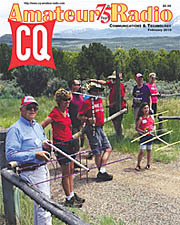 Photo feature on the 2011 USA and IARU Region 2 ARDF Championships. It's all here: APRS, FoxHunt app, PicoDopp, MicroFinder, GoogleHunt and DoppSite. USA ARDF Championships 2012 announcement and review of the DDF2020T Doppler by Global TSCM Group. Photo feature on the 2012 USA ARDF Championships at Mt. Laguna. Photo feature on the 16th World ARDF Championships in Serbia. A review of Marco Polo, a doppler that tracks pet pooches, plus dopplers for dits. The HB9CV antenna is a lightweight wide-frequency alternative to yagis and quads. Besides being useful for RDF contesting, it's serving in a new military application. Radiolocation is back on the 902-928 MHz band and it may have a chilling effect on Amateur Radio on that band in major cities. Tracking interference in Nebraska and California, plus complete plans for a "shrunken" six-meter RDF quad for your vehicle. Photo feature on the 2013 USA and IARU Region 2 ARDF Championships in North Carolina. Photo feature on the 14th USA ARDF Championships in Massachusetts and the 17th World ARDF Championships in Kazakhstan. Foxhunting fun at the Duluth Childrens Museum and at Scout JOTA in San Pedro, California. A foxtailing demonstration at Peaceful Valley Scout Ranch leads to the 2015 USA ARDF Championships. Radio-orienteers from all over the USA plus over 50 Chinese students converge in eastern Colorado to have fun finding transmitters. Foxhunting Weekend results are now being incorporated into my quarterly Homing In columns. There are many ways to hide a transmitter. Here are a lot of ideas plus the review of a brand new foxbox from Byonics. Wrap-up of the 2016 USA ARDF Championships in Texas plus a ham who is bring the sport to school kids in North Carolina. How hams are having fun with foxhunting from 3.5 MHz to 10 GHz. Full report on our team's trip to Bulgaria for the 2016 ARDF World Championships. Many clubs and groups had foxhunting fun on foot and in vehicles. New Radio Merit Badge syllabus includes ARDF antenna building and transmitter tracking. Reviews of new products from KB1RLI and from RigExpert. The full story of USA and IARU Region 2 Championships in Ohio, plus a report from the Region 3 Championships in Mongolia. Clubs and groups around the USA and the world having foxhunting. Preview of the 2018 USA ARDF Championships in northern California, plus planning for Foxhunting Weekend 2018. Story and results of the 2018 USA ARDF Championships, plus suggestions for foxhunting at Scouting's Jamboree-on-the-Air. Story and results of ARDF Team USA's travel to Korea for the 2018 World Championships. Stories from around the USA. Homing In appeared monthly in 73 Magazine from November 1988 until the magazine ceased publication with the September 2003 issue. My column then appeared in CQ VHF magazine, a quarterly publication, from 2004 through Fall 2013 and CQ-Plus Digital Magazine during 2014. 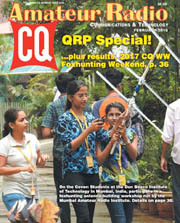 Now it appears four times per year in CQ Magazine, which is available in print by subscription and in Amateur Radio Stores. You can also subscribe to CQ in digital form, viewable on PC, Mac, iPad, iPhone and Android. The Fine Print: This is the official Web site for Homing In and other KØOV articles about RDF, but not for any particular magazine. I am an independent writer in southern California, not an employee of any publisher. I am available for writing and consulting for other periodicals and organizations. Opinions in these articles are my own, not necessarily those of the publications in which they appear. Text and artwork of all articles Copyright © Joseph D. Moell. All republication rights are reserved.